3. Once the order comes you can create the order referring to that quotation and the delivery, pgi and billing and the process can happen absolutely normal. My issue is that when I create the sales order, with reference to a quote, it does not use the inventory I reserved in the quote. It keeps getting other inventory or it gives inventory based on material RLT. Not sure where the issue is. Can anyone shed a light? Thanks everyone, I implemented Free of Charge orders to hold up inventory. This is the best way I found to deal with this requirement. Once you do the second step, has the stock reserved and you could see in MMBE as a special stock ? 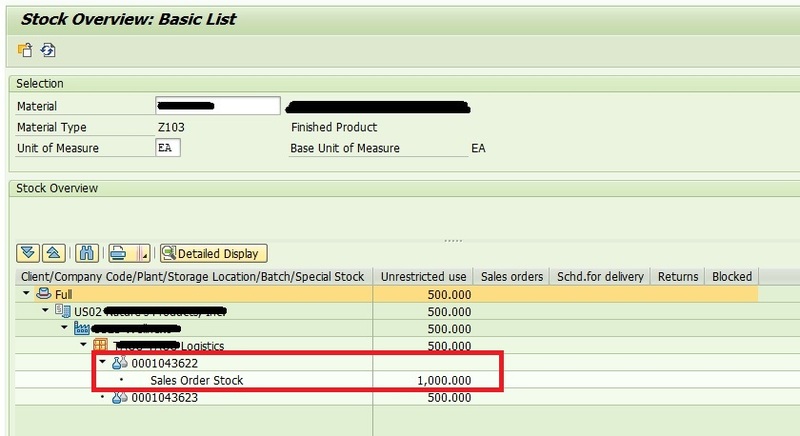 When you have assigned the stock against a quotation, how do you expect system to refer to that particular quotation stock while creating sale order. As per my understanding, it is like you are expecting system to assign the stock of different sale order to your current order. As from system perspective Quotation and order are 2 diff doc, and even if you create with ref, the stock posting cannot happen from quotation to order. When you have done posting against quotation, table MSKA would have updated with the quotation number, which means that stock cannot be used for other orders. I would like to suggest that after creating order, you have to do a transfer posting btw sale order(Quotation) to sale order (413 E). After which you should be able to deliver the order. I was also thinking about the same logic you did. I tried the transfer with 413E but it did not do anything. I believe I am doing something incorrectly. Would you please share the steps (what needs to be completed) so I can try this again?